A fun place for kids to learn about science while using all of their senses! Hours: Open Saturday, Sunday and Holidays (year-round) 3:30 p.m. to 7:30 p.m.
During the Argentine school year: Mon. – Fri. 10 a.m. to 5 p.m.
Summer Vacation (Dec. & Jan): Mon. – Fri. 12:30 p.m. to 7:30 p.m.
Winter Break: Mon. – Fri. 3:30 p.m. to 7:30 p.m. 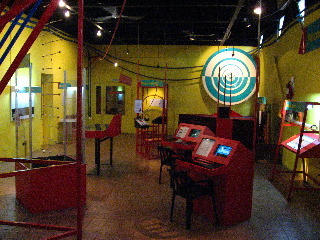 The museum teaches children about various mathematical, electrical and geological concepts. These concepts are taught by hands on activities. For example, a child can re-create the ocean waves with a wave machine, see the effects of whirlpools and control the whirlpools velocity, and even see how tornadoes are created. There are extensive descriptions of each of these activities, but they are all in Spanish. There is a room devoted to electricity. In this room you can play with solar power, water power and wind power. There is an exhibit which may be dangerous for young children. You take a copper wire and connect it to two separate charges, watch the wire turn red, then burn into two pieces. If you try to remove the wire before the electrical current is broken then you can burn your fingers. Overall I would give this children’s museum 4 out of 5 stars. My only complaint is that they don’t offer English translations.